CBT is a way of talking about how you think about yourself, the world and other people; and how what you do affects your thoughts and feelings. 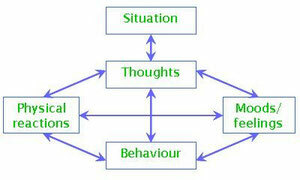 CBT therapy can help you to change how you think (Cognitive) and what you do (Behaviour). These changes can help you to feel better. Unlike some of the other talking treatments, it focuses on the 'here and now' problems and difficulties. Instead of focusing on the causes of your distress or symptoms in the past, it looks for ways to improve your state of mind now. Solihull CBT has been shown to help with many different types of problems. These include: anxiety, depression, panic, phobias (including agoraphobia and social phobia), stress, bulimia, OCD (obsessive compulsive disorder), PTSD (post-traumatic stress disorder), bipolar disorder and psychosis. CBT may also help if you have difficulties with anger, a low opinion of yourself or physical health problems, like pain or fatigue (e.g. Fibromyalgia).